Clearly it is impossible to research 8 generations in 60 seconds, but when you tell the story about that one famous ancestor, or infamous one, somehow there is a quick jump from you to your 7th great grandfather in no time. If you are looking for your sensational, yet factual family storyline, you don't have to suffer through a lifetime of research. This can be accomplished in as few as 3 generations, others may need to unveil 10 generations for that perfect storyline. You will have to do two things. 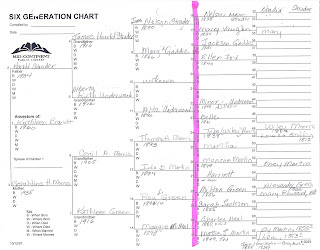 1) create a pedigree chart 2) perform genealogical research. Let me explain the difference. Pedigree charts have a bunch of related names ("begats" if you will); genealogical research tells a story of your ancestor. Don't confuse the two. Recently I took a client back 8 generations, however some were just pedigree charts even though I still provided proper citations and proof of relations. The real research however, supported the storyline. As researchers we know in order to complete full genealogical research (collecting documents, data, relations, social history, etc) on one family member can take months if not years. So, how can you get to the meat of your personal family "episode" quickly? I tell my clients, I'm looking for a few parallel events: "wars, mass exodus, and the opening of land - as it concerns the whereabouts of your ancestor!" Certain records yield the good stuff for determining your "quick" storyline 1) war records 2) local history books 3) deeds/wills 4) newspaper stories/ obituaries; and 5) comprehensive timelines. You can trace 256 grandparents in 8 generations, so somewhere there is buried a story of success such as the cunning escape, or a rags to riches; a story of pain and suffering such as refugees, and orphans; a story of absolute "favor" due to a class/caste system or royal bloodline; or a story of ....you get the picture. Of course the key is to focus on a story line you wish to share with others. Here are a few tips to creating your own fascinating story once you have a few generations of grandparents names. 1) War Records. The goal is to "fast search" to 1870 for names and family members to find Civil War information. Yep a pedigree chart of about 3-5 generations should do. For clients who are looking for a sensational, yet factual story, I first do a quick search to hopefully get me to at least 1870. Why? Now, I have possible names for civil war veterans (1861-1865). Great place to start. You can discover rank, and regimen information. Or, you can perhaps determine why an able man did not serve in the war? So much can be found on non-serving men, that you storyline might begin right here. You may want to become familiar with some under used records like the Forgotten Provost Marshall General's Records. And don't forget the Women in Wars. 2) Know your local history. If you know the history of the areas you are researching, you will know what to look for. I usually read up on the local history at every stage of my research. It might help eliminate a less intriguing storyline, early in the phase. Recently I was able to quickly (28 hours) attach a client to Rebecca Nurse of the Salem Witch Trials. REMEMBER: Nothing has value until you can prove your research with cited documents. So for the family, I provided all of the connection (unequivocal), and the story 11 generations back. Now...did I research in detail 6 of those generations? No...but I did prove pedigree! This research started in California (client) and ended in Salem Village. 3) Deeds and Wills. Nothing allows you to fast-forward through generations quicker than deeds and will records. Bequeathing to children and grandchildren is a blessing. (Sorry about your deceased ancestor(s), but here's not the time to get sentimental, unless of course your story lies in these records.) Now...here I take a pause. If there is a gnawing feeling in your gut suggesting the death to be questionable, I recommend you do a quick local newspapers search for the cause of death. If an excessive amount of land was acquired, definitely pull the land records to analyze acquisition and timeframe. You may even find that your ancestor settled the area. 4) Newspaper Stories/Obituaries. With digital/OCR newspaper database searches readily available for the researcher, why would you ever overlook this search? Obits may provide full family histories, solidify descendents, and move you a full generation back - often with dates! I usually dedicate one research session a week to newspaper searches. I only use free newspaper databases. For a primer, you may wish to get started with the post Old Newspapers: A Treasure Hunt. These old newspapers also give you a great view of your ancestor's home place. 5) Comprehensive Timelines. To have a good story, you need a plot, a reason, a goal. I use historical timelines to gain an understanding of the era. Many ethnic groups moved in clusters for a reason. Many explorers faced their demise when moving westward to open territories. There were plagues and epidemics that full families succumbed to. Oh...the list goes on and on. But use this tool to perhaps answer: Why? Voila...in 5 easy steps, you have your sensational story. Ok...maybe not in 60 seconds, but I bet you can leap to that ancestor's story in less time if the story is fascinating enough! Here is a compiled list of handy links referenced in this blog post. http://a3genealogy.blogspot.com/p/8-generations-in-60-seconds.html. The Palatine immigration of 1710, resulted in about 3,000 Palatine Germans being sent to America. Exhausted by the frequent wars that ravaged their border-lands, many Palatines were able to reach Holland and England to meet their fate. Many refugees were sent to London and later transported to New York. The purpose was to relieve the financial burden to the Crown, and to support the English Crown’s (failed idea) of building its British Fleet from the north eastern pines (tar). It is said that these Palatines on the original 1710 Subsistence Lists were never really pleased with the idea of working with the Pine Tar, since their preference was land and farming, but they settled on both the east and west sides of the Hudson River to pay back their debts to the crown. Although there are many places to research, my preference is to begin with the churches, you may wish to begin with the well documented Monument to the Palatines containing the names of the families who arrived at Hudson's River in the fall of 1710. This monument was erected eight years ago on the grounds of St. Paul's Evangelical Lutheran Church in West Camp and dedicated by the Saugerties Historical Society on June 13, 1998. The refuges made up of about one third each: Lutheran, Catholic, and Reform. So visiting the early settlement areas, and scouting for early church records may result in a successful search. However, know that the British governor forced the Catholic refugees to convert to Protestant before emigrating to the new colony of NY. And it is possible that a few followed the Anglican missionary, at the risk of being an outcast in the German community. A researcher of Palatine ancestors may also wish to get their eyes on the translation of Rev. Kocherthal’s Records of St. Paul’s Evangelical Lutheran Church at West Camp: Volume I (1708-1843), but know that it is possible that a non Palatinate subject may be listed, since Kocherthal worked outside the community also. The translation was done in 1976 by Frederick S. Weiser. Of course it is imperative that I list the valuable works of Henry Z. Jones, Jr: The Palatine Families of New York: A Study of the German Immigrants Who Arrived in Colonial New York in 1710. Jones also gives us More Palatine Families: Some Immigrants in the Middle Colonies 1717-1776 and their European Origins Plus New Discoveries on German Families who Arrived in Colonial New York in 1710. If you are in the area and you have NY Palatine ancestors, you may wish to visit a few places filled with Palatine settlements. But remember due to discontentment, some of these early Palatines left NY to settle in Pennsylvania. Using the map above, here are a few good resources per county. · #1 West Camp. Be sure to visit the Monument at the St. Paul’s Evangelical Lutheran Church. · #3 Katsbaan Church. The Kastabaan Church erected by the Palatines in 1732 was established in 1710. Records can be found as early as 1730. The Greene County Historical Society offers the Bronck Museum and Barns. · #2 East Camp, Germantown, NY. Church records may be found at the Christ Lutheran Church, 1811. · #6 County Historical Society. This research room has an index to the Columbia County Cemetery burials. For a good reference on this County I suggest you peruse the History of the Little Nine Partners by Isaac Huntting gives a thorough overview of the churches and history of Pine Plains NY. · #12 Rhinebeck Museum. Thirty-five families settled in the Rhinebeck area in (abt) 1714. Are you a descendant of refugees from the Palatinate of German Rhine? 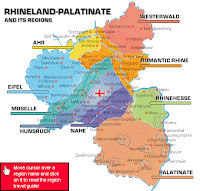 If you are pursuing family Palatinate research - Der Pfalz - which includes the land west of the middle part of the Rhine river (Rheinland-Pfalz), it is beneficial to grasp historical references pertaining to the region, the affects of Wm. Penn, timelines, and the resource tools available. Religious persecution, political oppression, and harsh winters drove thousands to Pennsylvania. They came from Germany, France, Holland, and Switzerland. The Germans began to abandon their homeland as early as 1606. Persecutions and murders spurred from the Reformation and Thirty Years War (1619-1648) between Catholicism and Protestantism, paralyzing the Palatines. As the Palatinate was ravaged by wars, their boundaries were also unsettling. Wars, like the War of the Grand Alliance (1688-1697), and the war between Holland and France during (1674-1675) also negatively affected the Palatines. As the devastation mounted so did the emigrations, resulting in approximately 100,000 Palatines to settle in Pennsylvania alone by 1750. William Penn traveled to Holland and Germany, in 1677, four years before obtaining a charter for Pennsylvania in 1681. A good reference to understand his philosophy and to understand why the Palatinates chose to follow him is explained in William Penn's Journal of His Travels in Holland and Germany, in 1677, first printed in 1694. From 1682 to 1776, Pennsylvania was the central point of emigration from Germany, France and Switzerland. 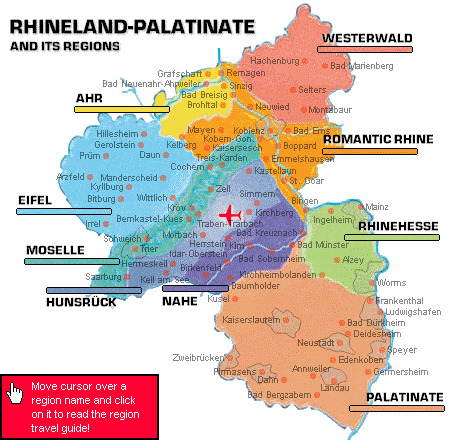 Most of the 18th century German emigrants were from the Palatinate. It was probably due to Penn’s tolerance for religious and political freedom that your ancestor emigrated to Pennsylvania. So, to connect this philosophy and the timing of your ancestor’s immigration, you may be able to pinpoint your ancestor’s homeland even closer. Peter came to America in the 1700’s for political reasons. He was born in the late 1600’s and lived in Siegen, Westfallen Germany along the Sieg River in the Rhineland-Palatinate region. This river, a tributary of the Rhine, runs south westwards to the city of Siegen and the hills of Siergerland. The region of Westfallen was in constant turmoil. Louis XIV led his French troops to invade the area and forced many to leave for other parts of Europe, especially England. Eventually many of the refugees migrated to the colonies. Perhaps Peter was of a “contributing” class. At the time, the preposition von ("of") was used to distinguish those who were land owners, leaders or possibly soldiers. However, Peter von Sieg lost favor with the government or lost his standing in the community. According to family legend, Peter voiced his disagreement with the Emperor or Government and even perhaps wrote an article stating his grievances. Peter von Sieg joined the other Palatine refugees and migrated with his family - wife, and sons Peter, Paul, Henry, and John - to America as early as 1720. With basic research and clues from social history and timeline of migration, Peter Von Sieg I was able to begin sketching Peter’s history. Volunteering not only gives back to the genealogy community, it allows you to gain experience. There are many opportunities in your local area to give a supporting hand, while you, too, further your research skills. Of course not all public libraries offer the genealogists what the Midwest Genealogy Center, in Independence MO (outside Kansas City), offers. Every blue moon, ok maybe more often than a blue moon, I stumble upon a female ancestor that isn’t just “strong,” or a leader, but revolutionary. Strong women leaders often surface after the death of their husband, or during wartimes. The strong women traits traditionally are exposed while the husband was off to war and the woman was left to maintain the home, raise children, and maybe even take on a job perhaps at the factory. But this role of women in our past is often viewed as temporary. But, what about our female ancestors who worked in fields of the brain? Those who set footprints for the rest of us to safely follow? Not to slight any of the strong Rosie ancestors of our the past, (and there were many), keep in mind being a Rosie was only a compliment when the men were away. We may find one or two strong women who were outed in WWI. And, we know there were women who did far more than expected to support the Revolutionary War. And not all women were practicing the Scarlet O’Hara swoon during the Civil War. Many of us have celebrated the polka-dotted bandanna Rosies of WWII. We even know about the Women in Military Service for America Memorial at Arlington National Cemetery. But, what about the others? Those who didn’t return from their temporary WWII jobs to settle in their household duties after the war? As family historians and genealogists, we often caste the woman’s role aside, but someone had to be the descendents of these socially defiant women who worked in “fields of the brain” even after the war. A few of these women were described in the recent CNN article Rediscovering WWII's female 'computers’. As a genealogists, the parents, grandparents, environments, and historical references that contributed to the unique choices of each of them is of interest. 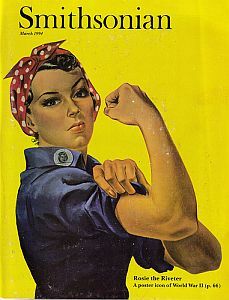 Rosies served their country well, but women like the WWII female “computers” should be revered as our hidden pride. As genealogists and family historians we look forward to finding photographs. They hold valuable information. From dress to background details we can often pinpoint an era. One of my favorite finds as a genealogists are tintype photos. In the US these photos were most popular around the civil war era, 1856 - 1867, but did not really disappear until after WWI. Some would say as late as WWII. Due to its durability, it is likely that the family historians will sooner or later stumble upon a tintype (or several) in family photo albums, military records, or Native American territory records. They were also used to track run away slaves, and may be found in slave master records or copies of them in local newspapers. Tintype photography was affordable and could be offered in a variety of sizes. There was no tin used in tintypes, except perhaps the tin shears used to separate the photo from the plate. Although affordable, there were a few disadvantages. In ridding themselves of glass plates, tintypes used mirrors in the camera to reflect the image resulting in what appeared to be on the right was actually on the left. This made most all of our ancestors left handed when holding a rifle. So knowledge of the photography type is important when analyzing photos. Not all photographers used the tintype, known as ferrotype in England. It was definitely frowned upon by reputable studios due to the poor quality, and lack of craftsmanship. 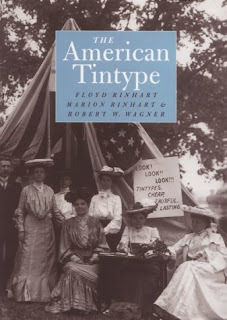 But when Adolphe Alexandre Martin, introduced tintype to the US (1853-1856), the timing could not have been better for the ambitious entrepreneurs. Street vendors, hobbyists, and entrepreneurs offered their services to the “common” man, stripping photography from being reserved for the elite class. Street vendors who emphasized the versatility and durability of the tintype, were able to sell small photographs for lockets and larger ones for albums. As the civil war ensued, there was a built-in market. Photographs were made prior to enlistment as memorabilia for the wife and family, and much money could be made by visiting military encampments to photograph soldiers. Question: What does Tim McGraw and a3Genealogy Have in Common? Answer: NBC's Who Do You Think You Are? Airing Feb 11th. 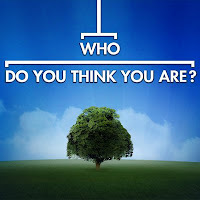 Kathleen Brandt, the founder of a3Genealogy, Kansas City, Mo, was able to conduct genealogy and historical research for the NBC series Who Do You Think You Are? for both the Tim McGraw and Ashley Judd episodes. She will appear in the Tim McGraw episode airing Friday, Feb 11, 2011 as a guest genealogist! Be sure to watch 8/7central. If you want to chat while watching the show, join the GeneaBloggers' Blog Talk Radio hosted by Thomas MacEntee. Although hosting a viewing party, Kathleen Brandt will surely call in. and participate in the chat discussions.